For me, this is the definitive live album. Up to this point, I'd been raised on Adam and the Ants and Simon & Garfunkel through my parents, and Madonna and Frankie and Pat Benatar were kind of my own thing. I remember about a year before I heard Iron Maiden, I was in my big cousins' house in Aberdeen. They were five or six years older than me. I had to go upstairs to use the bathroom, and they weren't in, and I saw this closed door, so I opened it. It was like walking into hell. It was amazing and frightening. There were posters everywhere, of guys with long hair and leather jackets, and women as well. There were records all over the place. 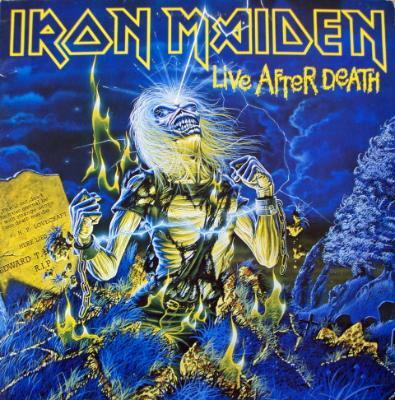 I saw an Iron Maiden monster on the cover of one of them – Eddie, obviously. I remember looking at it all, my jaw dropping, and running back down the stairs, away from this heavy metal den. I always thought heavy metal was bad. It was like punk. It was dangerous, and out of my league. But cut to the last day of term, around 1986, and my friend at school, Robin, gave me a cassette tape. It was written in red biro, and it was Iron Maiden's Live After Death. So I went home, and because it's the last day of school, you have this kind of longing thing don't you? It's really powerful. You've got the whole summer stretching out ahead. And I put the tape in the machine and turned the volume right up – by this time I had my sister's record player in my bedroom – and I lay on the floor and I pressed play. It just blew me away. It was the strongest musical thing I'd ever heard. That was me for the whole summer. That was me for the next three or four years. About a year later, I went to see Iron Maiden live at the Playhouse in Edinburgh with Robin. We always talked about how much we loved heavy metal. We wouldn't listen to any music that had keyboards in. If we knew a band we liked had a keyboard player, we would never mention him.